Barbara Ann Blackwell Keys, 48, of Dothan, Alabama, formerly of Gainesville, Georgia, passed away Sunday, March 31, 2019 in Braselton, Georgia. Born in Tucker, Georgia, Barbara was the daughter of Robert Junior and Margaret Ann Blackwell. She married Peter Scott “Pete” Keys on July 13, 1991. 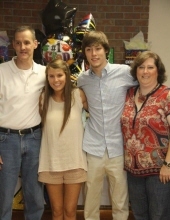 After graduating from North Hall High School, Barbara went on to Piedmont College and Brenau University. She worked as a preschool teacher at First Presbyterian Church of Gainesville. A member of Lakewood Baptist Church in Gainesville, she enjoyed jewelry making and raising her husband, whom she helped retire from his 21-year career in the U.S. Navy. Barbara was preceded in death by her father. Survivors include her husband, Pete Keys of Dothan, AL; her mother, Margaret Ann Blackwell of Gainesville; a son, Tristian Keys of Gainesville; a daughter, Brandi Keys of Gainesville; a brother, Bobby Blackwell of Gainesville; a granddaughter, Bella Sue Hale, and another grandchild on the way, her little bambino. Funeral services will be held at 3:00 pm Saturday, April 6, 2019 at Crowell Brothers Funeral Home, 5051 Peachtree Industrial Blvd. Peachtree Corners, Georgia. The family will receive friends from 1 to 3:00 pm Saturday prior to the funeral service. Burial will follow a Peachtree Memorial Park, Peachtree Corners. Memorial Donations in memory of Barbara may be made to the American Cancer Society. To send flowers or a remembrance gift to the family of Barbara Ann Blackwell Keys, please visit our Tribute Store. "Email Address" would like to share the life celebration of Barbara Ann Blackwell Keys. Click on the "link" to go to share a favorite memory or leave a condolence message for the family.